We've been waiting for you. Not you, you. Yes, you. That's right. It's your time to join us in a new era, with the second edition of Illuminati. 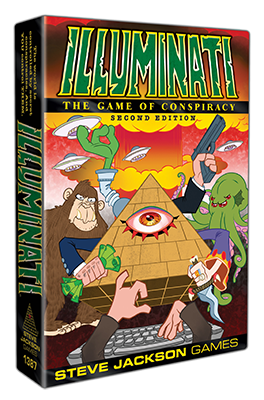 We know you've been waiting for some time, so we're happy to finally extend this invitation to the Illuminati, featuring all-new art by Lar DeSouza (Munchkin CCG). It was time for some current conspiracies, so we've included new predictions to appeal to the younger generations (to entice all those Millennials enjoying Fortnite now). Mastermind – I mean, designer – Steve Jackson answered some general questions in our basic runthrough, giving a behind-the-scenes look at the game. But not too behind the scenes; loose lips sink ships.